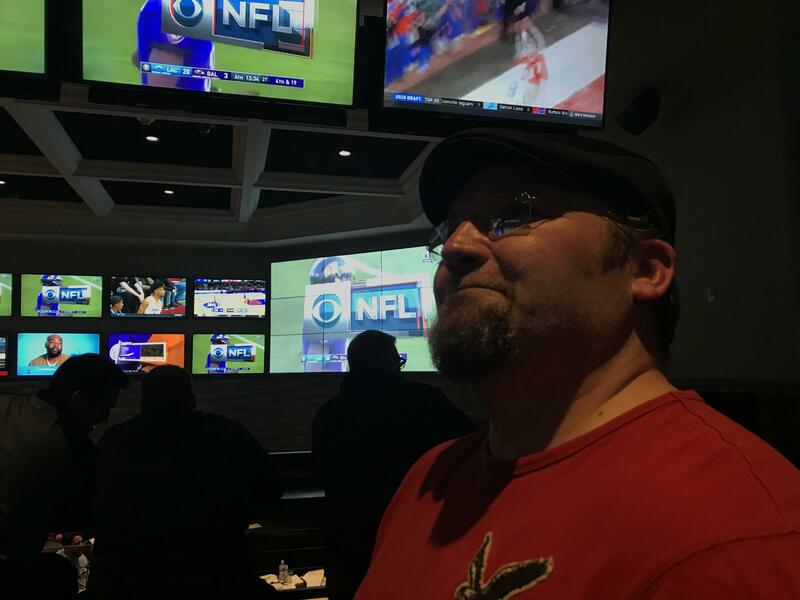 A man watches Super Bowl LIII at the Westgate Superbook sports book, Sunday, Feb. 3, 2019, in Las Vegas. Last year, the United States Supreme Court opened the door for states to make it legal to bet on sports. More recently, Connecticut lawmakers voted to send a bill that would legalize sports betting to the floor of the state legislature. But what could legalized sports betting look like here in the Land of Steady Habits? To answer that question, let's take a look first at neighboring Rhode Island, which debuted sports betting in November. Twin River Casino in Lincoln is one of two sportsbooks in Rhode Island where you can bet on games. Mark Titan lives about an hour and a half away in East Hartford. "There’s two ways to get here," said Titan on Sunday, January 6. "You can go up I-84 to I-295 down Rt. 146 or you can go Rt. 2 to I-395 to Rt. 6 -- backroads that way." Titan had the Los Angeles Chargers and the Philadelphia Eagles in his $300 teaser bet, so he had to get both games to go his way in order to win. Titan had some buddies watching the game with him, including Adam Droz of Glastonbury. Droz also has a teaser bet, but he has three teams involved. He likes going to Twin River to bet and watch games. He wishes Connecticut had that kind of offering. "Just being here -- over 100 screens, the big jumbotron, the ambiance," he said. "You’ve got two sets of fans – you’ve got the Chargers and the Ravens – cheering when a big play happens. It’s almost like you’re at the game." It’s certainly possible that sports betting will be legal soon in the Constitution State because it’s happening in many other states and Connecticut needs the money. Initial estimates have the state getting about $30 million in revenue a year by the third year of legal sports betting. Droz said that Connecticut shouldn’t be picky about the amount it gets from sports betting revenue as lawmakers also consider all kinds of ways to make money – from tolls to weed. "We're like a deer in headlights -- we're staring at other states around us and yet we're afraid to do it because we're a conservative state," said East Hartford resident Mark Titan regarding movement on the legalization sports betting. But who gets to run the sportsbook in Connecticut? The state is exploring partnerships with professional sports leagues, off-track betting establishments -- even going through the Connecticut Lottery to generate more revenue. Any of those moves could prove legally complicated. The state has existing gaming compacts going back to the 1990s with the Mashantucket Pequot and Mohegan tribes who run the state’s two casinos. If the tribes -- or anyone else -- get sports betting, the governor has to amend the existing compacts to move forward. “I think it’s imperative that the governor comes out and gives the legislature some direction where he would like to go,” said Joe Verrengia, the house chair of the Public Safety Committee, the one that just approved sports betting. Further complicating the issue is that the tribes think the compacts give them – and only them – the right to operate sports betting for the state. Verrengia has acknowledged that they’d have to be included in sports betting. But, he said, he’s not ready to cut out everyone else. “I just can’t believe the claim of exclusivity on something that wasn’t even legal at the time,” he explained. There’s also the question of how to maximize revenue, while still making sports betting an attractive business. Connecticut’s proposed cut of sports betting is a 10 percent take. That’s a big contrast to Rhode Island, where the state is taking a whopping 51 percent. Mark Titan, the guy from Connecticut who made the teaser bet in Rhode Island, said the time for Connecticut to act is now – residents are going over the border to buy marijuana in Massachusetts and bet on sports in Rhode Island. “We’re like a deer in headlights – we’re staring at the other states around us and yet, we’re afraid to do it because we’re a conservative state,” he said. You can say that about how the Ravens offense reacted to the Chargers' pass rush in the game that Titan and his friend Adam Droz bet on. The was game well in hand at the start of the fourth quarter, until the Chargers' Melvin Gordon scored a touchdown. But you’ve got to hit on more than just one outcome to win or lose a multi-team teaser. The guys had different bets related to the Bears/Eagles game later that night. In the game, Bears kicker Cody Parkey missed a short field goal as time expired. The Bears lost the game, 16-15. Titan won $500. But the kick made Droz lose his teaser. Read the second and third parts in this series on sports betting in Connecticut. Could Legalized Sports Betting Be The Answer To Curb Connecticut's Illegal Market? If you log onto some overseas website to bet on sports, or you do it through a bookie at the local bar, or even if you and your buddy have $20 riding on the Giants/Cowboys game, you’re betting illegally. Sports betting could soon be available at your fingertips. Connecticut lawmakers could grant state residents the ability to gamble on their phones if they legalize sports betting. Proposals that would expand gaming in Connecticut are on their way to the floor of the state legislature. Lawmakers passed several bills Tuesday, ranging from legislation that would skirt federal approval to authorize the building of a casino in East Windsor, to blueprints for how sports betting could be adopted in the state. Facing a criminal investigation about political interference, the Department of Interior abruptly reversed course Thursday and announced it has accepted a gambling amendment necessary for the Mashantucket Pequot and Mohegan tribes to jointly construct a casino in East Windsor to compete with MGM Springfield. The Connecticut Lottery wants to partner up with the state on sports betting.